Watchmen is the quint-essential comic book and comic book geek Zack Snyder has already brought us 300, but next year brings us the Watchmen. The film looks to be amazing and has had nothing but great reviews coming from the lucky individuals that have had a chance to see it. This week at the Scream Awards Snyder came out and showed a extended trailer. Also today I found this amazing new teaser poster for the film. The trailer is not much different from what we have already seen, but it has a couple new shots, proof that they have finished more effects shots. 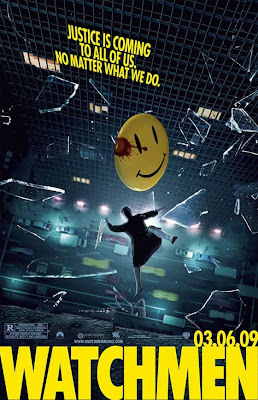 The poster features the scene where the comedian is launched out of his apartment and begins falling. Both the extended trailer and poster are awesome, so scroll down to check em out! How awesome is Watchem going to be? Next year cannot come quick enough! Screw Thanksgiving, Christmas and New Years, just get me to the Watchmen release date!